I got glow-in-the-dark tape. Where do I place it? 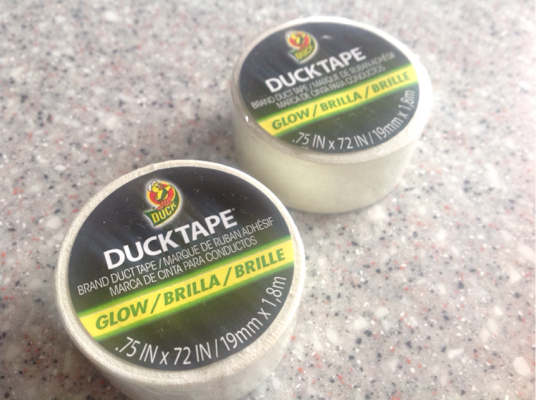 Would I be able to use glow-in-the-dark duct tape to help illuminate a bike at night? I already ride with forward and rear lights. You don't want glow-in-the-dark tape -- it's only useful if you store your bike in a dark shed and need to find it. The amount of "glow" is such that it's only visible in pitch darkness -- and that's for only a few hours after it has been exposed to bright light. What you want is called "retroreflective tape" -- it reflects light back in the same direction regardless of the angle of incidence. It essentially turns your whole bike into a bike reflector. You can also buy it in adhesive rolls. Go wild with it, put it on anything and everything on your bike -- especially things that move as the eye is more sensitive to motion. The side of the bike is particularly important since we tend to have front and rear lights, but little on the side except wheel reflectors (which often fall off). This is some retroreflective tape that I put on the rear fender and seat stays of my commuter (I have more retro tape on the sides and front that aren't visible in this photo). Left is under normal light, right is with my camera flash. Photos by me, released to public domain. I would put reflective tape round the frame and the handle bar, in such positions that it can be seen by oncoming traffic and traffic from the side, (like the middle part of the handle bar and/or the head tube, the down tube and if you have a lot also on the seat tube, and if you can find a spot, also on the back of our bike, if you have fenders that come down enough on them otherwise just under the seat might work. And on all bags you have on the bike, any location. Glow in the dark tape might have a fun effect, not going to add to your safety but you can use it in the same spots when you want the fun of it. My bike has reflectors all around and on the tires, and still I would add more if possible. I'd recommend putting it partly around each wheel - so as it rotates it creates a flashing movement. Elsewhere, bars and front &rear triangles maybe? Reflective tape works well on the sides of your bike where you might not have lights. On the side of the forks helps people to see you coming out of an intersection. I've also seen it wrapped around two spokes. the movement helps catch peoples attention. Not the answer you're looking for? Browse other questions tagged night-riding . How to stop the corrosion? Recommendations for bike headlight…possibly running on AA batteries? What should I be looking for when buying reflective lights for night riding? How to avoid running over animals whilst cycling on a canal at night? Are collisions with animals something to be worried about when cycling in the country? Are MIPS helmets compatible with helmet mount lights or cameras?